Jenny and I have just returned from running a watercolour course in St Davids, Pembrokeshire, where we were blessed with some fine blasts of wind that made the sea froth, heave and crash onto the rocky coastline in a truly dramatic fashion. In Solva habour, however, things were tranquil, with hardly a ripple disturbing the reflections. The place seemed to be crammed with boats, making it a marine-painter’s paradise. Picking out a good composition with the more shapely boat or two takes some time when you’re wading through a veritable forest of masts. Any sensible artist would sport a pair of wellies and a suitable chair that keeps one well clear of the mud….and perhaps a small table for the water-pot and cappuccino, for then, if the tide rises during your painting you can gallantly continue even if your lower regions are below sea level. Mud, as I have ruminated on before, is a particular favourite element in my paintings: easy to get right and you can stick it all over the place – well, in the foreground, anyway. You can also use it to hide any mistakes. In this photograph the muddy channels act as an excellent lead-in to the two main boats, and can be moved to suit the composition. The ropes and chains can also be employed in this way. Emphasise rusty red chains and green seaweed-draped ropes (there is a magnificent example in the centre right) to include some colour variation, and perhaps change a white buoy (as seen on the far left) to a more colourful orange or red. 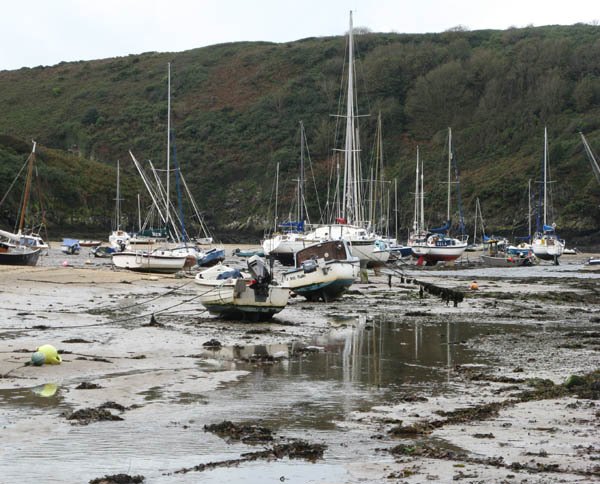 Reduce the number of masts and perhaps break up their reflections with a lump of mud or two in the water. If you would wish to include the background boats they should be painted in a far less distinct manner, otherwise the background becomes too cluttered and confusing. This entry was posted in David Bellamy, painting boats and mud by David Bellamy. Bookmark the permalink. This one is very interesting as the water reflecting the hill side is much darker than the mud and I am wondering which of the boats you will depict and which you will leave out. Any chance of seeing the finished masterpiece? Alas, Graham, although I did a demonstration painting of the scene I have no record of it. There are a number of ways of tackling the scene and the mud and water were so interesting visually that I will undoubtedly paint it again….in a slightly different way, so all I can suggest is keep watching this space.